RDS uses the PostgreSQL, MySQL, and MariaDB DB engines’ built-in replication functionality to create a special type of DB instance called a Read Replica from a source DB instance. Load on the source DB instance can be reduced by routing read queries from applications to the Read Replica. Multi-AZ helps improve the durability and availability of a critical system, enhancing availability during planned system maintenance, DB instance failure and Availability Zone disruption. Multi-AZ is a High Availability feature is not a scaling solution for read-only scenarios; standby replica can’t be used to serve read traffic. To service read-only traffic, use a Read Replica. Multi-AZ deployments for Oracle, PostgreSQL, MySQL, and MariaDB DB instances use Amazon technology, while SQL Server DB instances use SQL Server Mirroring. RDS automatically provisions and maintains a synchronous standby replica in a different Availability Zone. Copies of data are stored in different Availability Zones for greater levels of data durability. and minimize latency spikes during system backups. There might be a change in latency if the deployment fails over to the standby replica, although AWS is engineered with low-latency network connectivity between Availability Zones. For production workloads, it is recommended to use Multi-AZ deployment with Provisioned IOPS and DB instance classes (m1.large and larger), optimized for Provisioned IOPS for fast, consistent performance. RDS takes a snapshot of the primary DB instance from the deployment and restores the snapshot into another Availability Zone. RDS then sets up synchronous replication between the primary DB instance and the new instance. RDS automatically switches to a standby replica in another AZ, if enabled for Multi-AZ. Time it takes for the failover to complete depends on the database activity and other conditions at the time the primary DB instance became unavailable. Failover times are typically 60-120 secs. However, large transactions or a lengthy recovery process can increase failover time. Failover mechanism automatically changes the DNS record of the DB instance to point to the standby DB instance. Multi-AZ switch is seamless to the applications as there is no change in the endpoint URLs but just needs to re-establish any existing connections to the DB instance. RDS handles failover automatically so that database operations can be resumed as quickly as possible without administrative intervention. DB event subscriptions can be setup to notify you via email or SMS that a failover has been initiated. DB events can be viewed via the Amazon RDS console or APIs. Current state of your Multi-AZ deployment can be viewed via the RDS console and APIs. 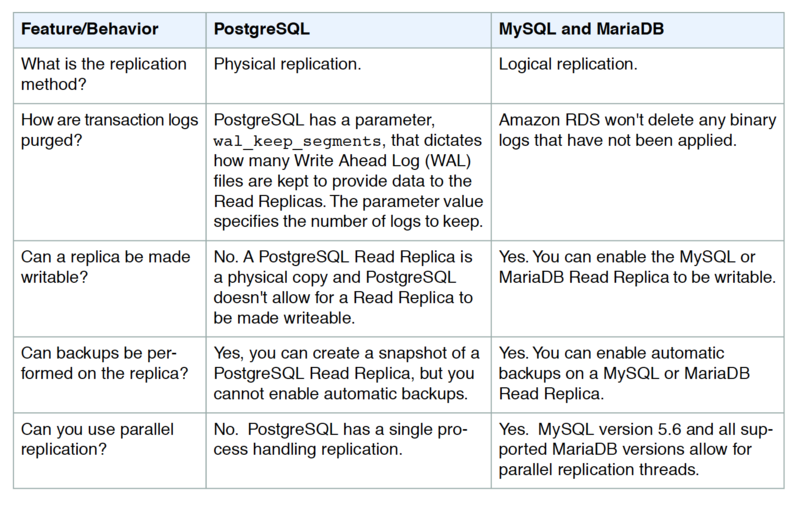 Amazon RDS uses the MySQL, MariaDB, and PostgreSQL (version 9.3.5 and later) DB engines’ built-in replication functionality to create a Read Replica from a source DB instance. Updates made to the source DB instance are asynchronously copied to the Read Replica. Load on the source DB instance can be reduced by routing read queries from the applications to the Read Replica. Using Read Replicas allow DB to elastically scale out beyond the capacity constraints of a single DB instance for read-heavy database workloads. Read Replica operates as a DB instance that allows read-only connections; applications can connect to a Read Replica the same way they would to any DB instance. Up to five Read Replicas can be created from one source DB instance. Existing DB instance needs to be specified as the source. RDS takes a snapshot of the source instance and creates a read-only instance from the snapshot. RDS then uses the asynchronous replication method for the DB engine to update the Read Replica for any changes to the source DB instance. RDS replicates all databases in the source DB instance. RDS sets up a secure communications channel between the source DB instance and the Read Replica, if that Read Replica is in a different AWS region from the DB instance. RDS establishes any AWS security configurations, such as adding security group entries, needed to enable the secure channel. During the Read Replica creation, a brief I/O suspension on the source DB instance can be experienced as the DB snapshot occurs. I/O suspension typically lasts about one minute and can be avoided if the source DB instance is a Multi-AZ deployment (in the case of Multi-AZ deployments, DB snapshots are taken from the standby). For multiple Read Replicas created in parallel from the same source DB instance, only one snapshot is taken at the start of the first create action. Read Replicas must be explicitly deleted, using the same mechanisms for deleting a DB instance. If the source DB instance is deleted without deleting the replicas, each replica is promoted to a stand-alone, single-AZ DB instance. If the source instance of a Multi-AZ deployment fails over to the standby, any associated Read Replicas are switched to use the secondary as their replication source. A Read Replica, by default, is created with the same storage type as the source DB instance. For replication to operate effectively, each Read Replica should have the same amount of compute & storage resources as the source DB instance. RDS does not support circular replication. DB instance cannot be configured to serve as a replication source for an existing DB instance; a new Read Replica can be created only from an existing DB instance for e.g., if MyDBInstance replicates to ReadReplica1, ReadReplica1 can’t be configured to replicate back to MyDBInstance. From ReadReplica1, only a new Read Replica can be created, such as ReadRep2. Read Replica can be created from other Read replicas as well. However, the replica lag is higher for these instances and there cannot be more than four instances involved in a replication chain. Serving read traffic while the source DB instance is unavailable for e.g. If the source DB instance cannot take I/O requests due to backups I/O suspension or scheduled maintenance, the read traffic can be directed to the Read Replica(s). However, the data might be stale. Business reporting or data warehousing scenarios where business reporting queries can be executed against a Read Replica, rather than the primary, production DB instance. 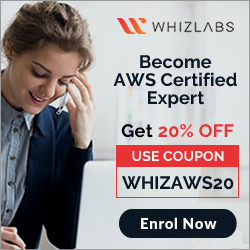 You are running a successful multi-tier web application on AWS and your marketing department has asked you to add a reporting tier to the application. The reporting tier will aggregate and publish status reports every 30 minutes from user-generated information that is being stored in your web applications database. You are currently running a Multi-AZ RDS MySQL instance for the database tier. You also have implemented ElastiCache as a database caching layer between the application tier and database tier. Please select the answer that will allow you to successfully implement the reporting tier with as little impact as possible to your database. Continually send transaction logs from your master database to an S3 bucket and generate the reports off the S3 bucket using S3 byte range requests. Launch a RDS Read Replica connected to your Multi-AZ master database and generate reports by querying the Read Replica. A company is deploying a new two-tier web application in AWS. The company has limited staff and requires high availability, and the application requires complex queries and table joins. Which configuration provides the solution for the company’s requirements? Your company has HQ in Tokyo and branch offices all over the world and is using logistics software with a multi-regional deployment on AWS in Japan, Europe and US. The logistic software has a 3-tier architecture and currently uses MySQL 5.6 for data persistence. Each region has deployed its own database. In the HQ region you run an hourly batch process reading data from every region to compute cross-regional reports that are sent by email to all offices this batch process must be completed as fast as possible to quickly optimize logistics. How do you build the database architecture in order to meet the requirements? IP of the primary DB Instance is switched to the standby DB Instance. Your business is building a new application that will store its entire customer database on a RDS MySQL database, and will have various applications and users that will query that data for different purposes. Large analytics jobs on the database are likely to cause other applications to not be able to get the query results they need to, before time out. Also, as your data grows, these analytics jobs will start to take more time, increasing the negative effect on the other applications. How do you solve the contention issues between these different workloads on the same data? A user is planning to set up the Multi-AZ feature of RDS. Which of the below mentioned conditions won’t take advantage of the Multi-AZ feature? A user is configuring the Multi-AZ feature of an RDS DB. The user came to know that this RDS DB does not use the AWS technology, but uses server mirroring to achieve replication. Which DB is the user using right now? If you have chosen Multi-AZ deployment, in the event of a planned or unplanned outage of your primary DB Instance, Amazon RDS automatically switches to the standby replica. The automatic failover mechanism simply changes the ______ record of the main DB Instance to point to the standby DB Instance. Can I initiate a “forced failover” for my MySQL Multi-AZ DB Instance deployment? A user is accessing RDS from an application. The user has enabled the Multi-AZ feature with the MS SQL RDS DB. During a planned outage how will AWS ensure that a switch from DB to a standby replica will not affect access to the application? Which of the following is part of the failover process for a Multi-AZ Amazon Relational Database Service (RDS) instance? The failed RDS DB instance reboots. The DNS record for the RDS endpoint is changed from primary to standby. You need to scale an RDS deployment. You are operating at 10% writes and 90% reads, based on your logging. How best can you scale this in a simple way? Create a second master RDS instance and peer the RDS groups. Cache all the database responses on the read side with CloudFront. Create read replicas for RDS since the load is mostly reads. Create a Multi-AZ RDS installs and route read traffic to standby. How does Amazon RDS multi Availability Zone model work? A second, standby database is deployed and maintained in a different availability zone from master using asynchronous replication. A second, standby database is deployed and maintained in a different region from master using asynchronous replication. A second, standby database is deployed and maintained in a different region from master using synchronous replication. A user is using a small MySQL RDS DB. The user is experiencing high latency due to the Multi AZ feature. Which of the below mentioned options may not help the user in this situation? Are Reserved Instances available for Multi-AZ Deployments? My Read Replica appears “stuck” after a Multi-AZ failover and is unable to obtain or apply updates from the source DB Instance. What do I do? You will need to delete the Read Replica and create a new one to replace it. 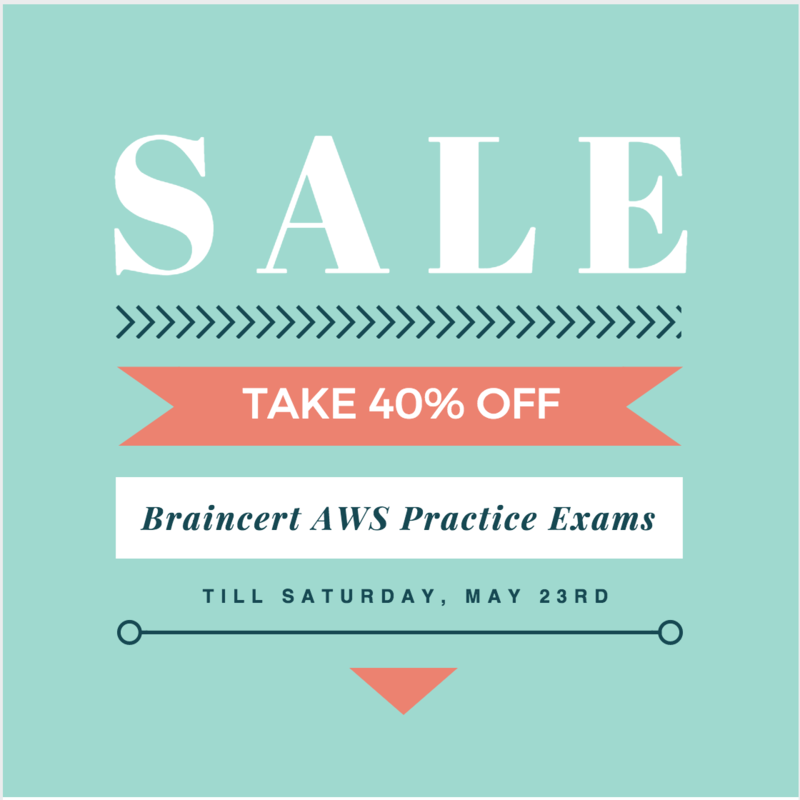 You will need to disassociate the DB Engine and re associate it. You will need to delete the DB Instance and create a new one to replace it. No charge. It is free. i am not sure about the answer cause Multi-AZ only without specifying that it will be a read replica will not help, i thought (c.	Amazon ElastiCache) would be better answer , what do you think ? Excellent article with real-life scenarios and explainations right to the point. It sums up more than a whole semester in our colleges these days (Germany). Thank you for this high-quality information, I will use it in the next few weeks when I’ll be building a data-warehouse & a report-section for one of my bigger clients. It was a pleasure to read – thank you very much! Thanks Srinivasu for the correction, update the Answer option. Can you please clarify why not ElastiCache ? Elastic cache is for mere caching of the query results for improving performance by not hitting the database. Postgres now supporting cross region read replicas, as of June 2016. But … when will exams reflect this? Thanks for update, will update the answer. However, the exam is slow to reflect any updates. Yes, Amazon RDS will emit a DB Instance event to inform you that automatic failover occurred. You can use the DescribeEvents to return information about events related to your DB Instance, or click the “DB Events” section of the AWS Management Console. For question (3), I believe that answers are A and C. How does read replica helps for Read and Writes? Thx. The question targets Read Contention and write is not an issue and hence the Read Replicas. I have a postgres in an ec2 on AWS . Now we are planing to move on RDS . & we do not want any downtime . We were planning on postgres replication between the post gres on ec2 & RDS postgres . Is this possible ? If yes can you give me pointers. ? I would prefer to create a database backup and import it directly to the RDS database. Is the database a production database ? Whats the size ? as the operation can be performed with minimal downtime given both the resources are within AWS. Yes its a prod database . The size is around 500gb . for that i will have to take incremental backups..which i don’t want to. Maybe just taking a dump and exporting to RDS would be the best option with some downtime. RPO diff between asynchronous replication or DB snapshot ? We can also minimizes RPO by frequent snapshots as replication also has some lag depend upon various factor like network available etc. With asynchronous replication, the RPO is very very low, it should, in fact RDS should start the asynchronous process almost instantaneously when master transaction is complete. Where as with frequent snapshots as you mentioned, you can only reduce the RPO, but in practise asynchronous replication would win over frequent snapshots. #29 is marked with two (2) answers and I am thinking it should just be A as Amazon doesn’t charge for replication bandwidth…was there a typo or did i miss something? Thanks Prince, yup its by error. Its A as it the data transfer between primary and standby is free. Jayendra – A stupendous effort on your part to maintain this blog. Hats off to you. #25. For multi-AZ scenario, the replication mode would be Synchronous and asynchronous is typically associated with Read Replicas. The answer should be a and not b.
Multi-AZ does not work across Region, so you have to setup up Read Replica across Region, which in this would need asynchronous replication. Q says: ‘The customer is interested in achieving a low Recovery Point Objective (RPO) for an Amazon RDS multi-AZ MySQL database instance.’ Not cross-region. So, shouldn’t the answer be synchronous here? If we are to consider 1rst statement which talks about cross-region and ignore multi-az, then wouldn’t read replica (being asynchronous in nature) fall behind because we have different regions. So, in this case ‘snapshots’ might make more sense. The wording is a little confusing. Can you please explain your approach to this q? Read Replica can be created across region for MySQL, even though it can fall behind but it would still have the lowest RPO. Also, Read Replica can be easily converted to Master/Primary database and be ready to use. Snapshots are taken only daily, during the backup window which would need to be copied over. Also, they are supplemented by transaction logs for point in time recovery, which would not work across region. Can you please explain for Q 4, why is A the right answer. Here is my thought process. I’m trying to eliminate options. B and D gets eliminated because you always to use managed services db over creating your own DB on EBS. A – Read Replica are asynchronous by nature. So over time, replicas can lag from the original db and thus you cannot guarantee the accuracy of the reports. C – If you send snapshots, there is time spent in extracting data from snapshots (which may be minimal). So if I have to compare C and E, I would choose between C and E.
I think I’m overthinking the problem. Anyway, hope to hear back from you. The key point here is to reduce the time. Hence A as you can create a Cross Region Read replica in the Tokyo HQ for DB in each region and use them to compute reports as the Read Replica will always almost have the latest data. Option E is wrong as there Direct Connect would be expensive and take time to setup. Thanks Amit, that right. Vertical scaling does result in automatic failover although the scaling is first performed on the standby and once successful the failover happens. Have corrected the question. If we are migrating a 4 X DB server to RDS (1 master, 3 salves, each with 100GB storage and there will be 1 TB analytics data), what will be the best architechture to migrate to RDS? Does the below make sense to you? with 1TB of data, you will need all instances 1TB and more ?